her name is maebelle. she is my new favorite household item. i downloaded the manual, threaded her up, and we were on our way. it’s been pure bliss ever since. 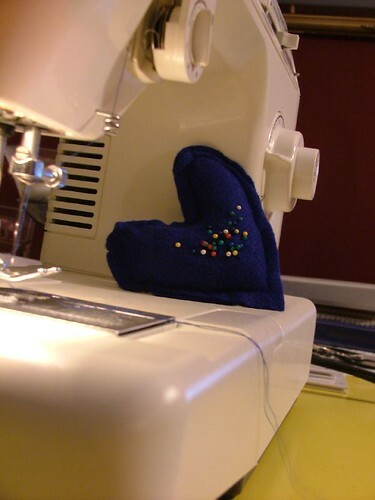 the first masterpiece maebelle and i created was this blue felt (remember that-here’s an appropriate use) heart shaped, somewhat wonky pincushion. i realized upon completing the cushion how desparately i need new pins. this of course, means a trip to the sewing store. i’ll need to find a chaperone to keep me in line. or i could just take the children with me- they’re perfect for ensuring mama doesn’t spend too long browsing. it’s that handy dandy middle-of-the-store breakdown screamfest, keeps me in check. uh, please ignore the trash can figuring prominently in this photo. and the dirty floor. i’ve been sewing, something had to suffer! 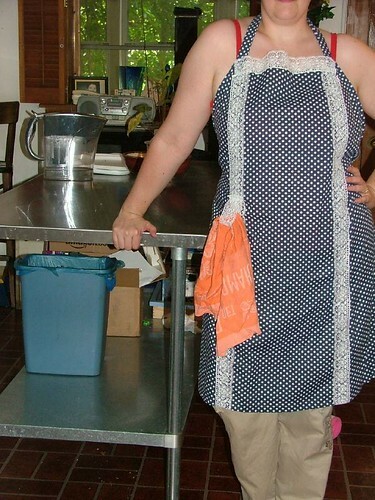 now i’ll clean it, since i have my smashing apron to protect my ever-so-fancy khaki pants. thanks, wordpress, for custom headers! this is a photo i took in germany of an amazing sunset. seemed fitting. what do you think? 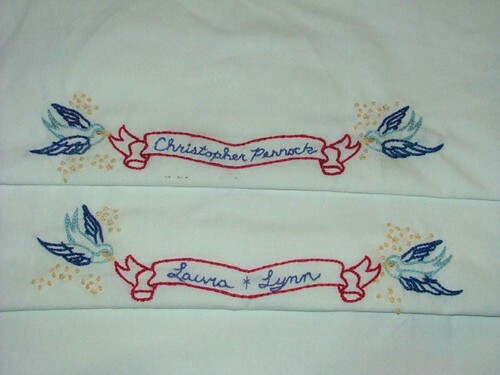 the wedding was good, the pillowcase gift was well appreciated by the groom, and i think by the bride, although it’s a bit hard to tell with her at times. i’m going to assume she was genuinely gushing and that she’ll actually use them. 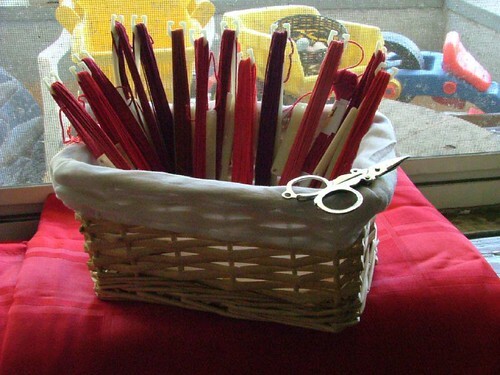 doesn’t it drive you nutzo to know something you made for someone to use is sitting, totally neglected, on the top shelf of the dark, dank linen closet? it’s enough to make me weep. whiplash this month is a bag. ha!, thought i, smug in my uber-craftiness. that was before i drew up a pattern wrong, cut it like a drunken sailor (yaaarrrg! ), and used el-cheap-o felt. for a bag. hi, i’m dumbdumb p. mcscrewitup, the artist formerly known as her smugness, have we met? back the drawing board. or, more accurately, TO the drawing board before completing the crappy finished product. i intend to learn how to quilt this fall, when business picks up and we’re swimming in moolah. <cough> UN-less i can convince someone i know who quilts to teach me. maybe we can barter some babysitting? or toys? claymation scripts? guess what?? my mom has a bunch of sewing machines! sitting around! collecting dust! and, as long as one of them has a manual, i should have some sewing projects posted next week. i really wanted to do some awesome song lyrics, inspired by debbie from 60 bugs, but i didn't think i should mess with the sublime pattern my first time. go visit debbie and buy some from her- they're really hella cool. hella, i say. then i continued on my spree and made a pretty little picture of flowers for a friend's baby, who is turning one. they're moving, so i thought a little something to frame for her new room would be nice. 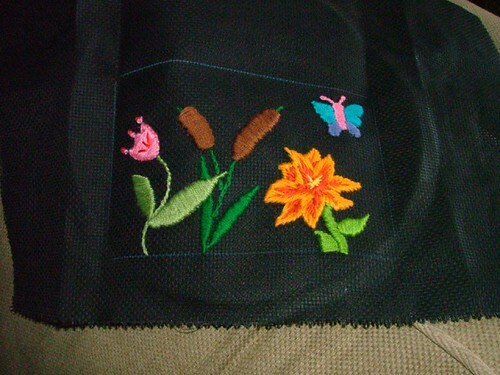 i drew this design on the canvas, but i sort of looked at jenny hart's flowers for help. I like the way it turned out- sorry for the yucky picture, the camera batteries were dying, as usual. in other news, here's wishing you a very happy belated WEST VIRGINIA DAY! what, you didn't bake a cake? yeah, me neither. we bought a car (and by we, i mean erich) in west virginia and couldn't get the title faxed to the bank, because, you guessed it, the dmv was closed in honor of WEST VIRGINIA DAY. but, never fear, we made the 6 hour (each way) drive with the two kids under 4 the next day. i could lay out the highlights of that trip for you, if there were any. father's day goodies around these parts included some farmer's market cherries and flowers, and a nice big card painted by sage with a little help from mama and zander. he liked its bigness (yes, i realize it's not a real word). i liked the ease with which it was made- masking tape and watercolors, voila! 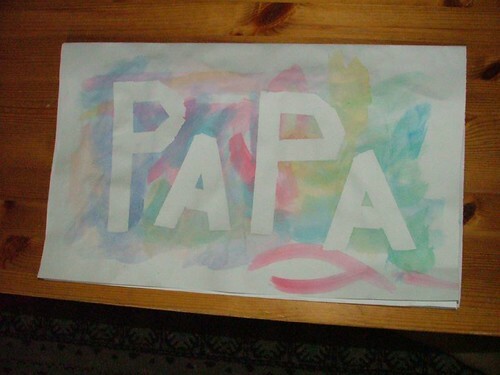 big giant papa's day card. on the inside, she dictated to me the following- "My favorite thing about Papa is playing the drums with him. We make a lot of music when we do it. Buddy likes to play the drum with Mama, and he tries to play the bottom. That is so silly!" 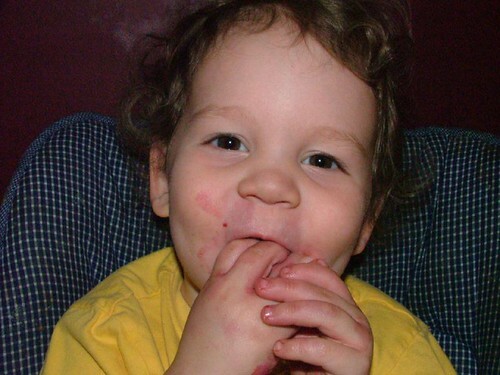 and finally, a cherry-covered face to close out the post right! today i bring you a collection of favorite things from my kitchen. 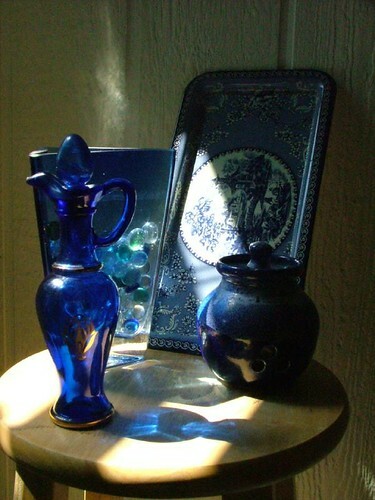 if i had my way, everything in my house would be made of blue glass, such is my abiding love for all things blue glass. ok, maybe not the sofa, but almost everything else. I really want a blue glass shower enclosure someday. hopefully the shower enclosure fairy is reading my blog today. the bottle is from my nana, who apparently has lots more coveted blue glass stashed away somewhere in her apartment. the triangular vase was a wedding present from someone i really love so very much, even though i can’t exactly remember who they are. exactly. but i have a pretty good idea. so thanks, , i really dig that vase. 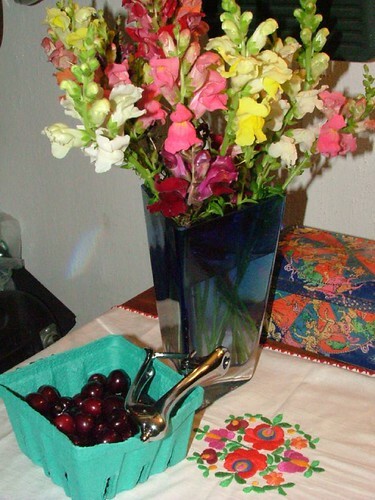 the tray was my mother-in-law’s, and the little pottery garlic house i bought myself at a craft fair years ago.